Your company's intellectual property -- whether that's patents, trade secrets or just employee know-how -- may be more valuable than your physical assets. Here's to establish basic policies and procedures for IP protection. Your company's IP, whether that's patents, trade secrets or just employee know-how, may be more valuable than its physical assets. Security pros must understand the dark forces that are trying to get this information from your company and piece it together in a useful way. Some of these forces come in the guise of "competitive intelligence" researchers who, in theory, are governed by a set of legal and ethical guidelines carefully wrought by the Society of Competitive Intelligence Professionals (SCIP). Others are outright spies hired by competitors, or even foreign governments, who'll stop at nothing, including bribes, thievery, or even a pressure-activated tape recorder hidden in your CEO's chair. IP protection is a complex duty with aspects that fall under the purview of legal, IT, human resources and other departments. Ultimately a chief security officer (CSO) or risk committee often serves to unify intellectual property protection efforts. With protection from cyber attack now critical, the chief information security officer (CISO) now plays a major role. This primer covers everything from establishing basic policies to procedures for IP protection. IP can be anything from a particular manufacturing process to plans for a product launch, a trade secret like a chemical formula, or a list of the countries in which your patents are registered. It may help to think of it as intangible proprietary information. The World Intellectual Property Organization’s (WIPO’s) formal definition of IP is creations of the mind — inventions, literary and artistic works, symbols, names, images and designs used in commerce. IP is divided into two categories: Industrial property includes but is not limited to patents for inventions, trademarks, industrial designs and geographical indications. Copyright covers literary works like novels, poems and plays, films, music and artistic works, for example drawings, paintings, photographs, sculptures, web site pages and architectural design. Rights related to copyright include those of performing artists in their performances, producers of phonograms in their recordings, and broadcasters in their radio and television programs. For many companies, such as those in the pharmaceutical business, IP is much more valuable than any physical asset. IP theft costs U.S. companies as much as $600 billion a year according to the Theft of Intellectual Property Commission. Patents grant the legal right to exclude anyone else from manufacturing or marketing your unique tangible things. They can also be registered in foreign countries to help keep international competitors from finding out what your company is doing. Once you hold a patent, others can apply to license your product. Patents can last for 20 years. Trademarks are names, phrases, sounds or symbols used in association with services or products. A trademark often connects a brand with a level of quality on which companies build a reputation. Trademark protection lasts for 10 years after registration and can be renewed in perpetuity. Copyright protects written or artistic expressions fixed in a tangible medium — novels, poems, songs or movies. 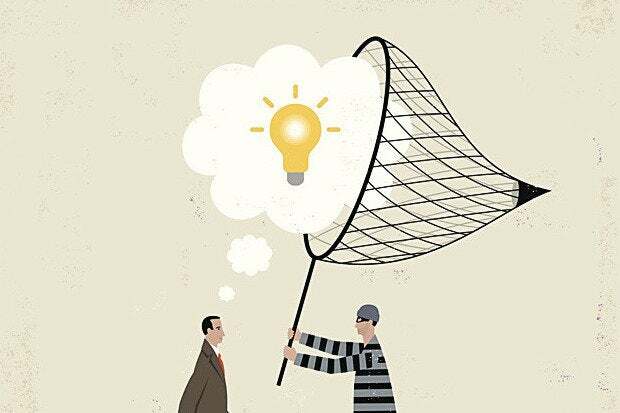 A copyright protects the expression of an idea, but not the idea itself. The owner of a copyrighted work has the right to reproduce it, to make derivative works from it (such as a movie based on a book), or to sell, perform or display the work to the public. You don't need to register your material to hold a copyright, but registration is a prerequisite if you decide to sue for copyright infringement. A copyright lasts for the life of the author plus another 50 years. Trade secrets can be a formula, pattern, device or compilation of data that grants the user an advantage over competitors is a trade secret. They are covered by state, rather than federal, law. To protect the secret, a business must prove that it adds value to the company — that it is, in fact, a secret — and that appropriate measures have been taken within the company to safeguard the secret, such as restricting knowledge to a select handful of executives. IP can can simply be an idea as well. If the head of your R&D department has a eureka moment during his morning shower and then applies his new idea at work, that's intellectual property too. How do you keep intellectual property safe? If your IP is stolen by ne'er-do-wells, catching them is hard, prosecuting them is harder, and getting the stolen information back — putting the proverbial cat back in its bag — is usually impossible. In this area, a little paranoia is quite helpful, because people really are out to get you. That’s why it’s important for the CSO, CISO, and chief risk officer (CRO) to be involved in protecting IP. Consider these real-life examples. An engineer regularly had lunch with a former boss now working for a rival, and fancied himself a hero for gathering competitive intelligence. The information he was giving up in return caused his employer, formerly the market leader, to lose three major bids in 14 months. Immigrant scientists from Eastern Europe who were working on an American defense got unsolicited invitations from their home countries to speak at seminars or serve as paid consultants. The invitations appealed to them as scientists — they wanted to share information about their work with peers. The countries saw this kind of intelligence gathering as cheaper than research and development. The steps below are the minimum you should to top keep your IP safe. If all employees understand what needs to be protected, they can better understand how to protect it, and from whom to protect it. To do that, CSOs must communicate on an ongoing basis with the executives who oversee intellectual capital. Meet with the CEO, COO and representatives from HR, marketing, sales, legal services, production and R&D at least once a quarter. Corporate leadership must work in concert to adequately protect IP. Printers, copiers, scanners and fax machines: Your input/output devices all store the documents they process, and they are typically networked and connected to remote management systems. Proper policies and procedures need to be in place to purge these documents and protect against unauthorized access. Cloud applications and file-sharing services: These might be company-managed or shadow IT. You need to know what your employees are using so you can restrict unauthorized cloud services and ensure that company-sanctioned services are properly configured and secured. Employees’ personal devices: An employee might email a document home, typically for benign reasons. Educate your employees on the proper handling of IP and have monitoring systems in place to track where your IP is being sent. Third-party systems: IP is often shared with business partners, suppliers, or customers. Make sure your contracts with those parties define how those third parties must secure your IP and have controls in place to ensure those terms are followed. CSOs who have been protecting IP for years recommend doing a risk and cost-benefit analysis. Make a map of your company's assets and determine what information, if lost, would hurt your company the most. Then consider which of those assets are most at risk of being stolen. Putting those two factors together should help you figure out where to best spend your protective efforts (and money). If information is confidential to your company, put a banner or label on it that says so. If your company data is proprietary, put a note to that effect on every log-in screen. This seems trivial, but if you wind up in court trying to prove someone took information they weren't authorized to take, your argument won't stand up if you can't demonstrate that you made it clear that the information was protected. Physical and digital protection is a must. Lock the rooms where sensitive data is stored, whether it's the server farm or the musty paper archive room. Keep track of who has the keys. Use passwords and limit employee access to important databases. Awareness training can be effective for plugging and preventing IP leaks, but only if it's targeted to the information that a specific group of employees needs to guard. When you talk in specific terms about something that engineers or scientists have invested a lot of time in, they're very attentive. As is often the case, humans are often the weakest link in the defensive chain. That's why an IP protection effort that counts on firewalls and copyrights, but doesn't also focus on employee awareness and training, is doomed to fail. A growing variety of software tools are available for tracking documents and other IP stores. Data loss prevention (DLP) tools are now a core component of many security suites. They not only locate sensitive documents, but also keep track of how they are being used and by whom. Encrypting IP in some cases will also reduce risk of loss. The Egress survey data shows that only 21 percent of companies require encryption when sharing sensitive data externally, and only 36 percent require it internally. If someone is scanning the internal network and your intrusion detection system goes off, somebody from IT typically calls the employee who's doing the scanning and tells him to stop. The employee offers a plausible explanation, and that's the end of it. Later, the night watchman sees an employee carrying out protected documents, and his explanation is "Oops...I didn't realize that got into my briefcase." Over time, the human resources group, the audit group, the individual's colleagues, and others all notice isolated incidents, but nobody puts them together and realizes that all these breaches were perpetrated by the same person. This is why communication gaps among infosecurity and corporate security groups can be so harmful. IP protection requires connections and communication between all the corporate functions. The legal department has to play a role in IP protection. So does human resources, IT, R&D, engineering, graphic design and so on. If you were spying on your own company, how would you do it? Thinking through such tactics will lead you to consider protecting phone lists, shredding the papers in the recycling bins, convening an internal council to approve your R&D scientists' publications, or other ideas that may prove worthwhile for your particular business. Over the years, France, China, Latin America and the former Soviet Union states have all developed reputations as places where industrial espionage is widely accepted, even encouraged, as a way of promoting the country's economy. Many other countries are worse. A good resource for evaluating the threat of doing business in different parts of the world is the Corruption Perceptions Index published each year by Transparency International. In 2016, the Corruption Perceptions Index ranked the following 12 countries as being "perceived as most corrupt": Somalia, South Sudan, North Korea, Syria, Yemen, Sudan, Libya, Afghanistan, Guinea-Bissau, Venezuela, Iraq and Eritrea.